Enjoy two outdoor activities in one day on this 8-hour private combo tour from San Jose. With a naturalist guide, visit the Sarapiqui region of Costa Rica for both adventures — whitewater rafting and horseback riding. Lunch and private transportation are included. Your tour starts with hotel pickup in San Jose by private vehicle for the drive to Sarapiqui, a region north of San Jose with a rainforest environment and flowing rivers. Horseback riding is first, which lasts 1.5 hours and takes place in the middle of a secondary forest. Then replenish your energy with lunch before the rafting portion of your tour, where you'll float down the Sarapiqui River. Enjoy a mix of Class II to Class III rapids and slow stretches as you travel 8 miles (13 km) along the river, watching for birds and admiring the verdant scenery. Your tour ends with return to San Jose for hotel drop-off. This was the perfect tour for a shorter day trip, but still full of excitement. 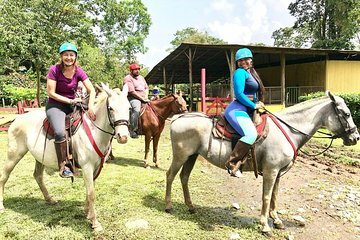 The horseback riding was not your typical trail ride, lots of hills, tight trails and various landscapes. The whitewater rafting was thrilling, our guide truly made it fun and special! I would definitely do this tour again!